After a very long search I was finally able to find a '67 1800s that was never ever rusted or accident damaged last summer. All of the original body seams and spot welds are also intact on this car. It replaces an identical one owned about 1980, before parting it out because it was just to too rusty to rebuild. The seller sent me over 100 photos of the car while it was being partially restored that included photos of a full glass out and stripped to bare metal prep for new paint. 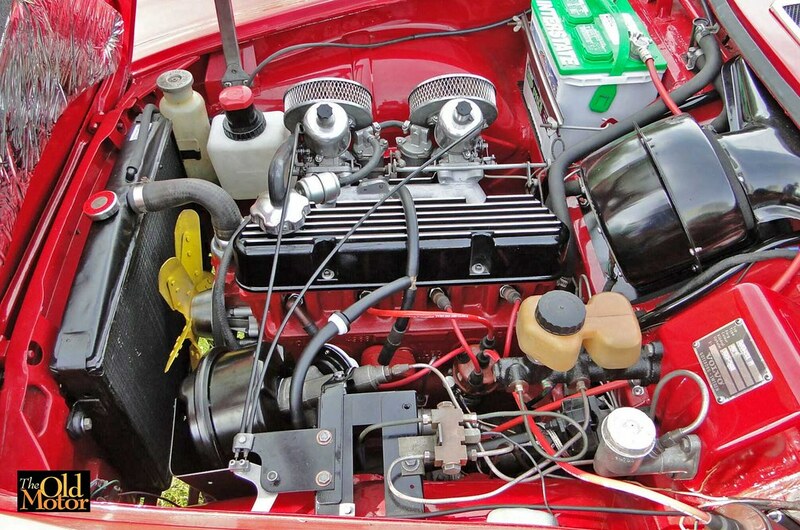 The original to the car B18 engine with a 10.5:1 CR and 115 hp and the trans with an overdrive were removed and rebuilt. At the same time and the engine compartment and the trunk were also detailed and painted along with the window openings on the inside of the body. After asking detailed photos of the bottom of the car up on a lift it looked excellent so a flight was booked to northern New Brunswick, CAN to go check it out. Usually I buy a project and do it myself, but the less costly way and quicker way to go the long run if you can find one like this. It all checked out very well, was purchased, and then driven 850 miles back home to Vermont without any problems. Have been able to trace it back to it to being a New England car in the past, but this one has led a very sheltered life and apparently has spent most of its life under cover for years. Other than the new paint and the recovered leather front seats it is largely original. The 1800s has been used as a daily driver ever day since returning home with it and over 5K miles have been put on it since then. It was taken off the road before the first snow storm arrived as lots of road salt is used here on the roads. The value of these cars has be sky rocketed lately and to protect the investment in this car only going to get period bolt on high performance parts. 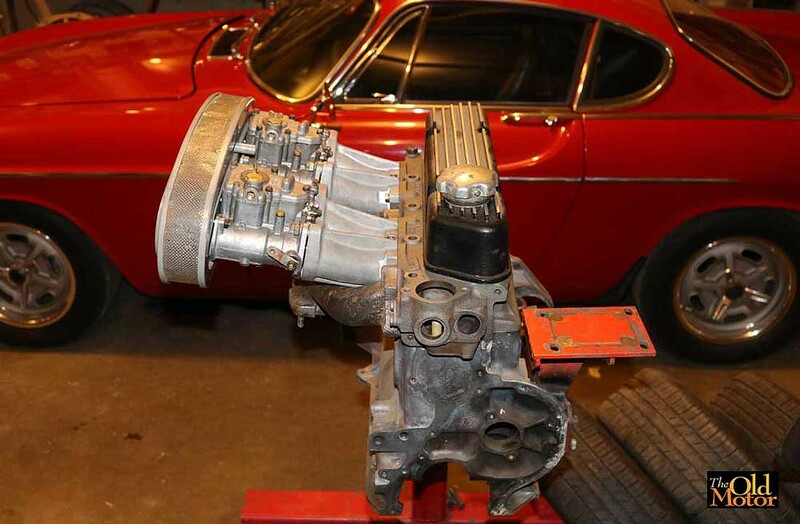 All of the original take off parts have and will be be carefully stored and and identified so the car can be returned to back to stock in the future in a week or so if needed, and all will be kept with the car. Photos taken last fall show that the bumpers have been removed as I prefer the looks of the bodywork without them and at the same time about a 100 lbs. of weight is removed. Halibrand "kidney bean" 15" x 7" wheels w/knock off pin-drive hubs have been found and installed and also Swedish Lesjöfors 30mm drop progressive rate springs that keep both the front end and rear at a good height for optimal handling. 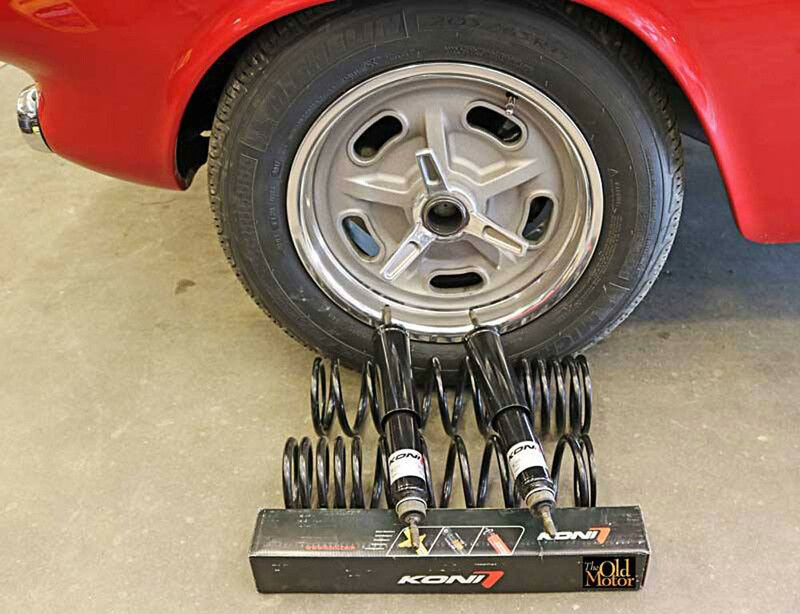 The Koni "Classic" period correct adjustable shocks have been fine-tuned for all around use just like in the old days (all four shocks can be adjusted in about 45-minutes). The ride is firm and comfortable but not harsh and it now handles extremely well. A lot of changes are going on with it this winter, the front end is being rebuilt and more details will be added soon. Last edited by vintagewrench; 12-23-2018 at 07:25 PM.. Thanks, the bumpers do virtually no good at protecting the cars because of the low height and most modern cars and trucks will either take out the grille or the rear panel. Always preferred 1800 series cars without them. 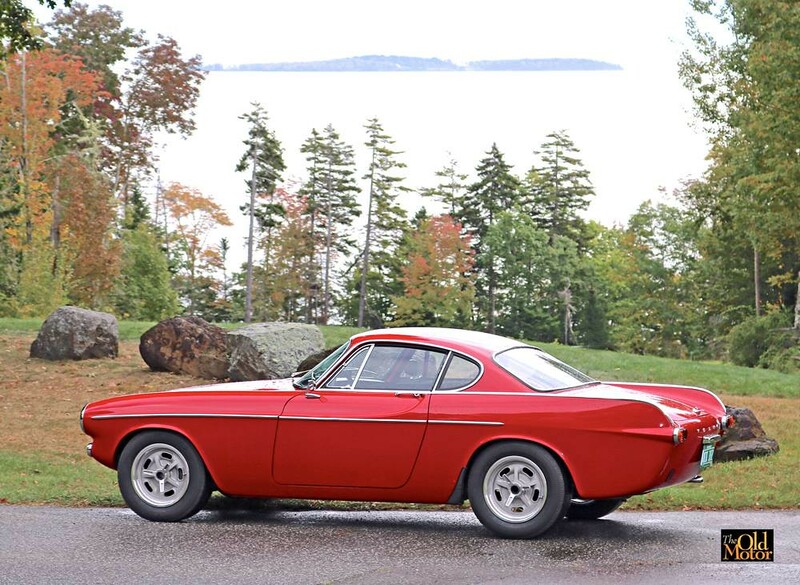 The bumpers always looked like an afterthought to me when compared to other bodywork done in Italian design houses at the time even though it was by Pelle Petterson, a Swede whose father Helmer Petterson was a Volvo engineering consultant that designed the PV444. 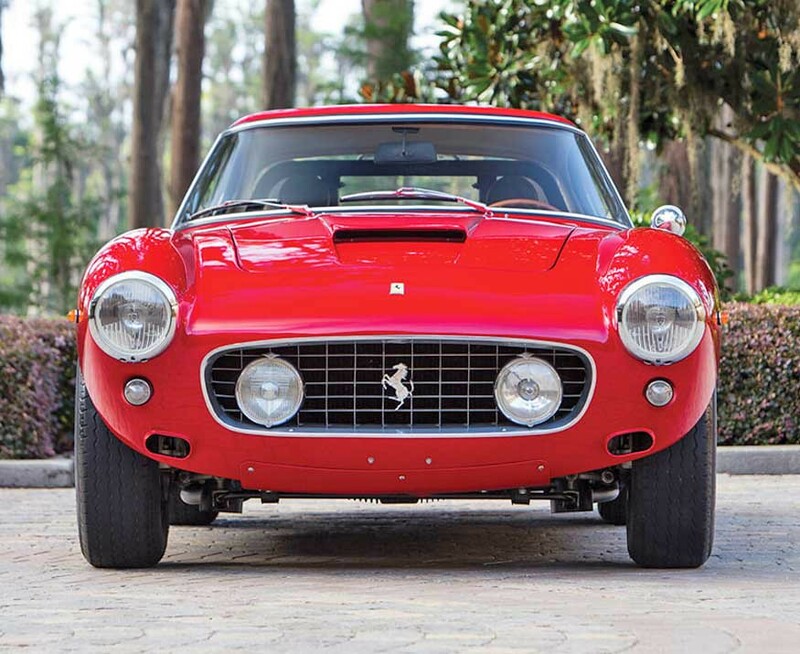 A set back egg crate grille and an aluminum surround similar to this Ferrari 250 GT Berlina Competition Coupe are planned for down the road, and it can be done without cutting the nose sheet metal. Thanks, it will be a work in progress for at least a year or so due to limited time. I have been following your progress and your car is looking great! This image gives you a good view of the reproduction knock off hubs for the Halibrand wheels. The hubs are made of heat treated forged 4140 chrome moly and are attached to the Volvo hubs by chrome moly drive pins w/tapered ends like a lug nut and are tightened by an internal hex drive to 70-FP. The pins drive the wheels via drilled and reamed holes on the back side the wheels. The spinners are forged heat treated 6061 aluminum and the taper on the inside of them centers the wheel and securely holds them on at over 250 foot pounds when fully tightened with a five pound lead hammer. When in position all four of the wheels run out less than .010 in both directions which is quite remarkable. All the messy silver colored spots on the hub and pins are never seize, which keeps the steel hub pieces and the aluminum from causing corrosion by contact with each other. The aluminum knock offs are designed for wheels with a much deeper dish, but are not hardened. With a fixture set up in the press I was able to reshape them from straight to curved and the appearance with these wheels has improved 100%. Please run some safety wire into your spinners. I know I'm preaching to the choir but this makes me far more nervous than it should. Are you using a lead hammer to remove them ? Are they reverse thread on one side like AC Cobras ? I have a tool on a permanent loaner to a friend to remove the knock off, it avoids having to hit them. I'll try to dig up a picture. Beautiful car by the way, I'm very jealous. Matt, no real reason to be so concerned, the L.H. hubs are R.H. tread and the R.H. hubs are a L.H. thread and both stay tight because the rotation of the wheels and knockoffs keep them tight. 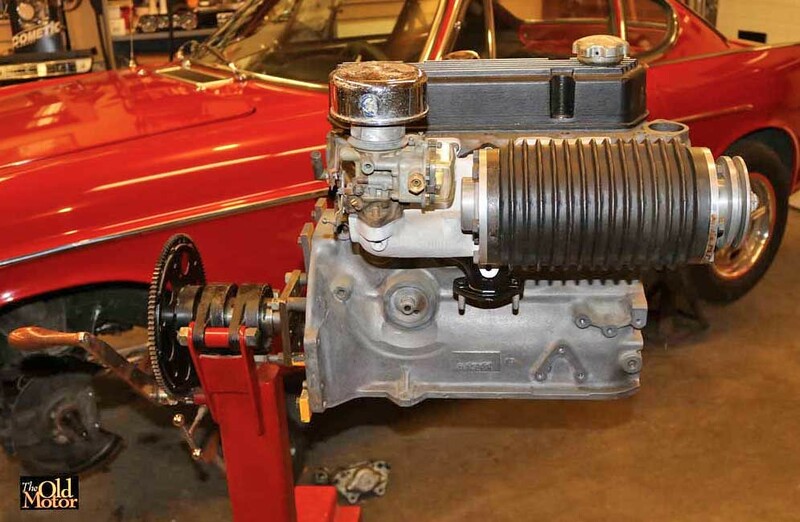 Both the hubs, knockoffs, and wheels are identical those used on the original small block Cobras. If you were running in a race safety wire is a good idea in case you spin out and end up going backward for a long distance. After over 25-years of working on clients vintage racing cars here in the shop and at the track I have never seen or experienced a knock off properly tightened ever come loose. Halibrand wheels were first used on sprint and Indy cars in the late-1940s so the wheels could be changed quickly and they are never safety-wired at the end of a pit stop after a tire change. I don't think Ford,s pit crews did it at LeMans on the Cobras and GT40s either. Yes, as was mentioned earlier I use a 5-pound lead hammer and keep the end covered between uses with a snap on sewed leather cover to keep the lead from picking up grit and later scaring aluminum, or chrome-plated steel spinners. In over 2500-miles over all types of roads last fall these knock outs never loosened (checked them several times) and were still tight when I took them off this winter. Thanks for the complement. The only reason I ended up with this car was because of a very long search and moving fast when it became available. At the time the Canadian $ was down quiet a bit compared to the US $. In the end between that and an owner who just wanted it gone I was able buy it for only a couple for thousand more that what the average batched up unrestored car needing a lot of work was selling at the time. Deals are out there. The 1800s was partially restored by Adam Westrake, a very particular aircraft mechanic and included a complete rebuild of the original engine, transmission, overdrive, and the brakes. Other than the valve cover, a replacement brake booster, and an alternator, the engine compartment is quite original looking. 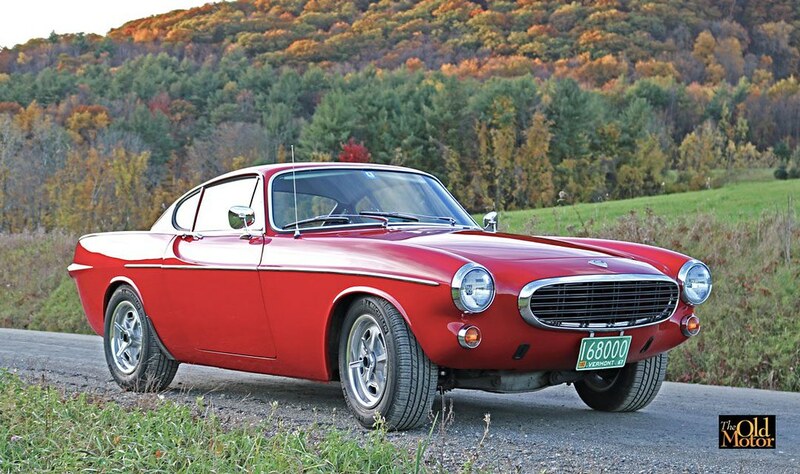 Upgrades with some vintage Volvo speed equipment that has been collected will happen after the front end is rebuilt and a few other things that are in the works are straightened out. On the Trans Canadian Highway on the way home with it in overdrive the car was able to do a max speed of about 105 mph. It cruises great at 75 to 85 on the interstates, the engine is spinning at 4000 rpm in overdrive at 85. Final gearing in the P1800 and the 1800s models is 4:56 to 1 so the OD is usually used above about 65mph. Last edited by vintagewrench; 02-08-2018 at 04:01 PM..
Small question, though. 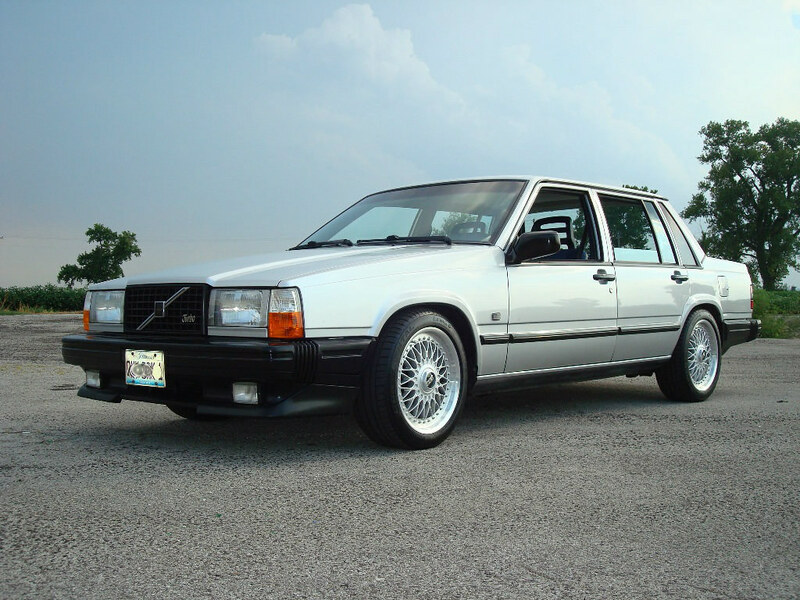 If you're not going for strictly stock appearance with the no-bumpers and knockoffs - why stick to original on the motor? Why not some nice period-appropriate mods like DCOE's and cam/head? John, Thanks for the good words about the car. As mentioned in the last post quite a bit of period vintage speed equipment has been collected for this car and the '68 220 station wagon. I now have two Judson Superchargers, one meant for a B18 (picture above) and another that would work well on a bored and stroked B20. Also have two sets of Volvo Competition Service intake manifolds, a set of vintage Weber 40 DCOEs, a set of 45 DCOEs, and an original VCS air cleaner. There are a number of things I want to do to this car before going back to finish the head I'm building for use with the supercharger. Hoping to get to all of this next fall or winter and add a cam from Tinus Tuning. It will very soon become my nice weather daily driver again this spring. What ever I don't use on this car is going to go on the 220 wagon in the future. 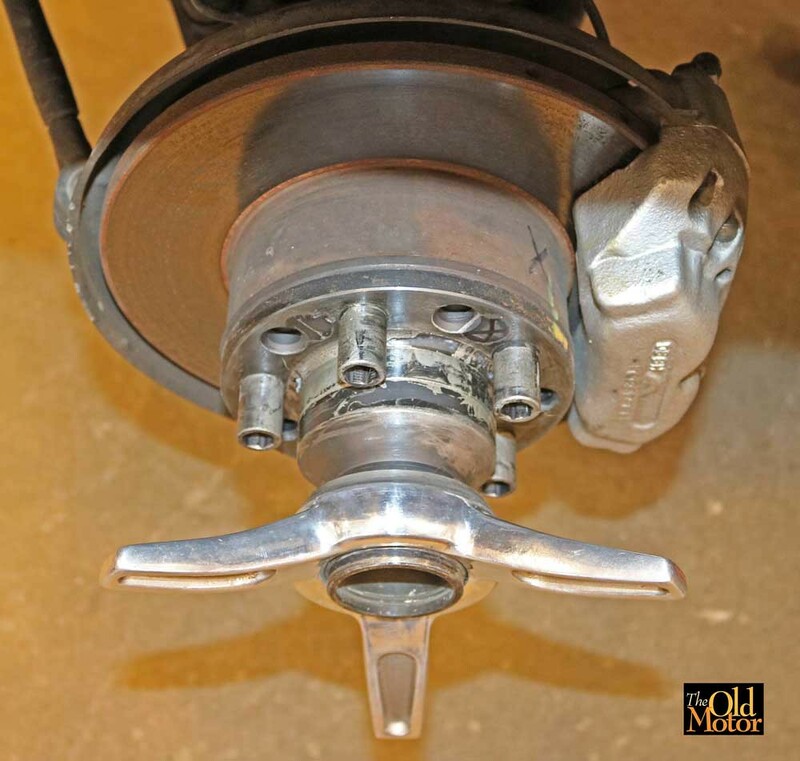 Last edited by vintagewrench; 02-09-2018 at 12:38 PM..
Late last summer I installed full set of new Swedish Lesjöfors progressive rate springs and a set of Koni "Classic" hydraulic shock absorbers to replace the old worn out shocks and springs. Adjusting the shocks for a balance of a decent ride and excellent handling even when pushed hard in cornering has been achieved, and the chassis now works very well at both ends of the spectrum. These springs tend to settle in and sag quicker than a linear spring, but I am working on a way to regain lost ride height when they do. This winter the front end will be getting new ball joints, bushings, tie rod ends, and an alignment. Last edited by vintagewrench; 03-08-2018 at 02:09 PM.. Very nice! It looks so pretty under the hood I thought it was 'done'. Hey, Thanks to all of you for you approval of the 1800s and the way I'm setting it up. More coverage of progress on the project soon - have been concentrating on getting the car ready for the road this Springtime instead of posting about what has been accomplished. Photo below taken on the coast of Maine in Camden last fall on a nice 1000-mile weekend fall foliage run. 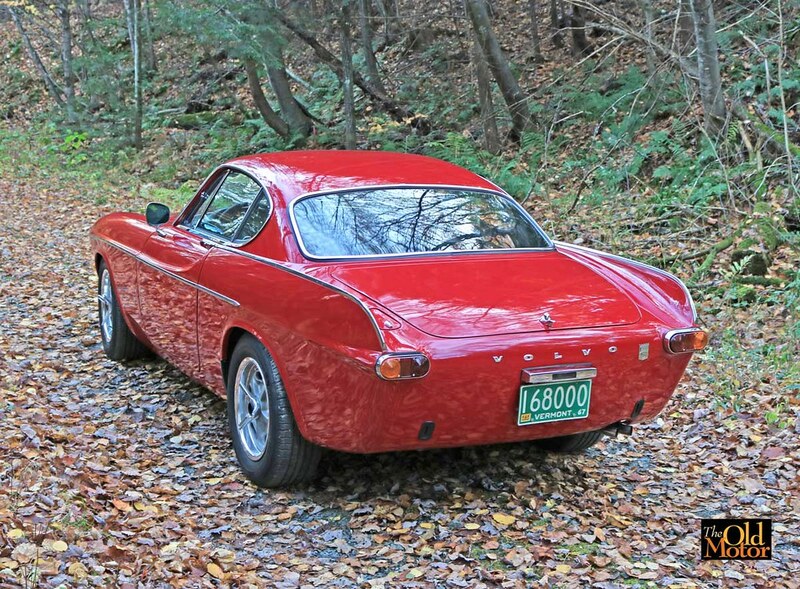 As you all know a 1800 is a perfect GT car for covering miles on the Interstate highways quickly in overdrive, while also having great handling characteristics on winding two-lane country roads. Last edited by vintagewrench; 02-28-2018 at 06:46 PM.. I always liked that about both my 1800E's. Get them into OD on the highway and you were *barely* touching the gas to cruise along at 65 mph. The PV.... is obviously really pushing around a LOT of air. This 1800s is happy cruising all day at 85 mph in OD w/a 4:56 gear…It works out to about 4250 rpm and the engine sounds very happy if a bit busy. All of the 122s cars I have had over the years (15) including the present '68 wagon is just like your PV, aero challenged and get pushed around in the wind. This original 16-inch steering wheel is a place holder for a vintage17-inch four spoke rubber-covered competition steering wheel. The larger sizes make these cars and 122s models much easier to steer, especially at low-speeds. 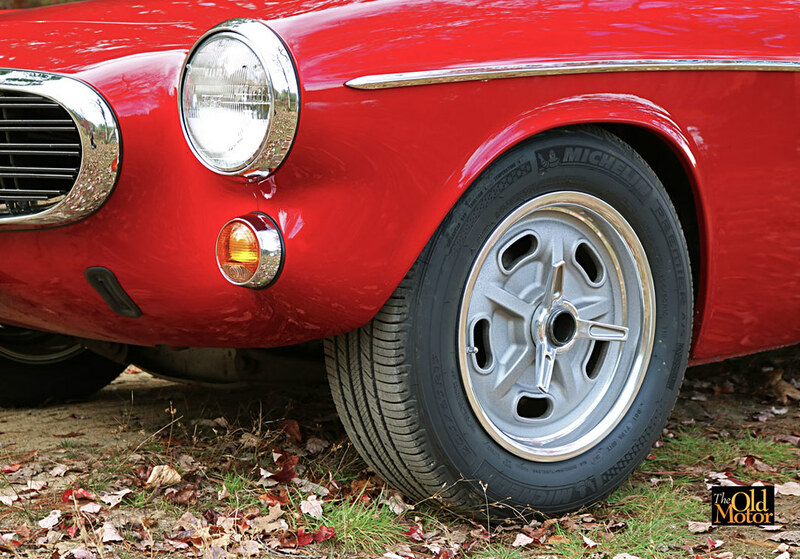 Have used 14-15-inch wheels that are quicker steering before but are hard to deal with in most parking situations. P1800 and 1800s steering wheel rims are usually riddled with cracks which are then covered over with a quick and dirty vinyl cover or on occasion an ill-fitting leather one. The rim can be restored by filling in the cracks with epoxy, priming. sanding followed by painting it with an automotive high gloss black urethane. Someone in Italy has apparently invested in making the molds to cast a new plastic covering onto the old spokes and the steel rim. After working at restoring pre-1933 vintage racing and touring cars I have wrapped a number of steering wheels in 1/8" and 3/16" braided cord for customers as it was popular back in the period. 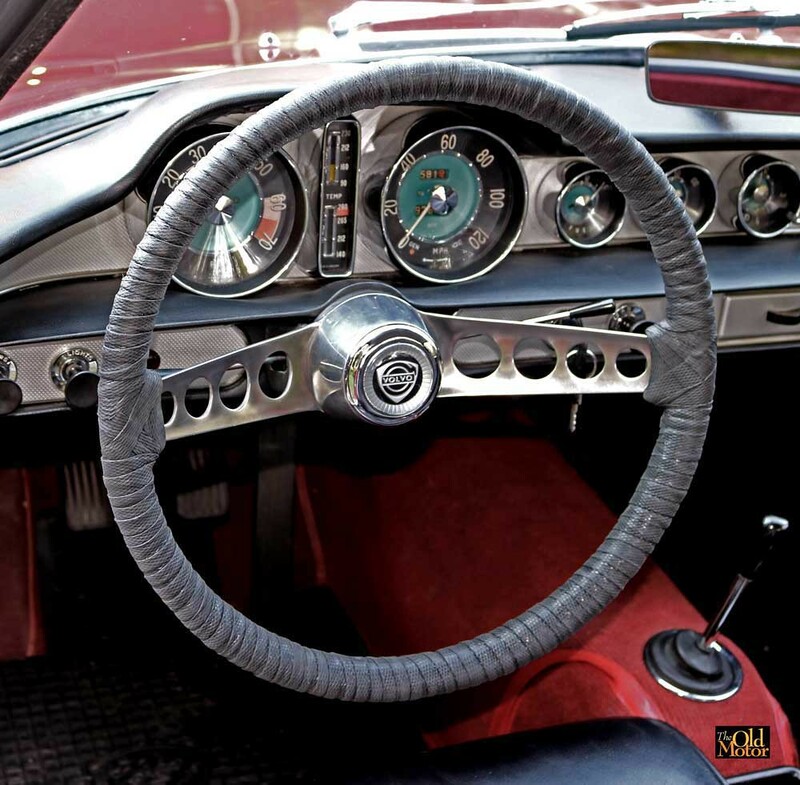 Some drivers of pre and postwar racing cars began wrapping steering wheels in black friction tape. In the fifties and sixties the tapes used changed to plastic and rubber which is the competition look that I was trying to duplicate. I choose to do an experiment on this 1800s wheel and used two layers of tape: the first a 1/8" thick neoprene/EPDM/SBR/foam blend diagonally wrapped around the wheel edge to edge. It was then covered by a layer of conformable and texturized 30-mil black rubber electrical splicing tape made of ethylene propylene rubber. It is UV resistant, does not change color, and sticks to the first layer very well and melds itself together in a way that it becomes one. It has a temperature range of -50 to 160F. Right from the beginning it has been exceptionally comfortable to use and steering is easier even in tight spots because you don't have to use some of your effort to grip the thin and uncomfortable original rim and also turn it; gripping this wrap is not an issue and most all of the effort goes towards actually turning the wheel. After over 5K-miles of at times hard use last summer and fall the wheel has turned blacker in color, and both layers have adhered very well to the rim, and to each other. On a 1K-mile four-day weekend run with the temp in the mid-90s F, two days after it was finished the edges of the tape were just a little bit sticky, but that has disappeared over time. It's not for everyone, but it is what I was looking for and it works very well in actual use. Last edited by vintagewrench; 03-04-2018 at 04:25 PM..
not only is this a beautiful car but so is your photography! Thanks! And I noticed that you are making good progress on your 1800E. "The wheel that grinds twice as slow, grinds twice as fine...."
Or maybe it simply grinds twice as slow. 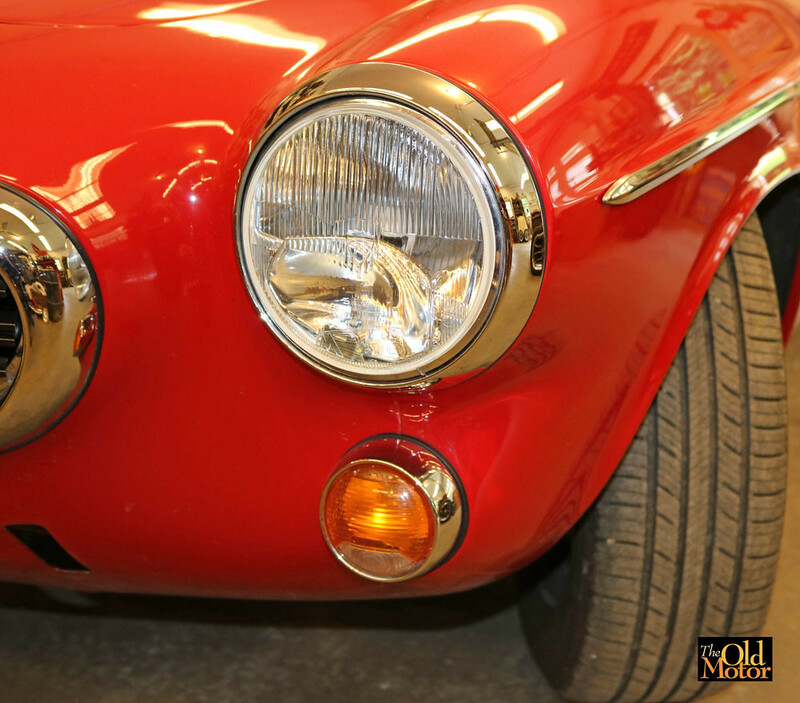 Late-1960s new old stock flat-faced French Marchal Ampilex halogen headlights have been added to the car. The low "city beam" bulb is in the reflector in the front of the lamp, the high beam is a combination of the low beam light and the rear bulb reflector. At one point only the French police could use these lamps due to the high output lighting the units provide.